From the start, settlement leaders claimed that a terror attack was behind the crash, assuming that the police denied the possibility, seeking to maintain public order. "We demand the security forces to stop the occurrences of stone-throwing, which not only endangers lives but also offends the honor of the state and its citizens," the mayor of the West Bank settlement of Kiryat Arba, Malachi Levinger, said. "We warn that if the security forces don't put an end to the phenomenon, citizens might find themselves in mortal danger and proceed to protect themselves by any means available. "There are tens of thousands of Jews driving to Hebron to pray these days, and their safety must be protected," he added. MK Michael Ben Ari (National Union) demanded that an investigation into the condcut of the Police Spokesman's Office is launched. "There is a concern that the police published a false press release in order to calm the mood, in line with the police's culture of lying," he said. "The Shai District commander should not be dealing with politics." Kiryat Arba Councilman Bentzi Gupshtain said: "It's shocking to think that the Police Spokesman's Office could have covered up the murder of a baby and his father only to prevent 'price tag' response and a disruption to Netanyahu's speech. The time has come to look into the Israel Police." 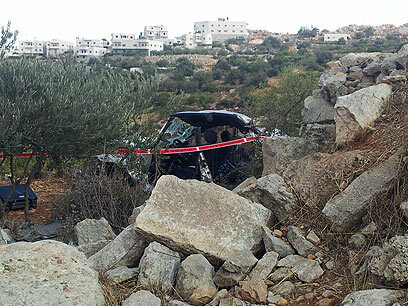 See all talkbacks "Police conclude Kiryat Arba car crash a terror attack"